Pressured valves on your equipment can be shut-off by Valve Lockout devices. 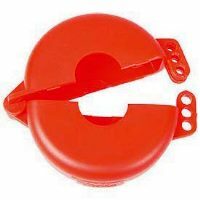 There are different types to choose from for your lockout tagout needs. Gate Valve lockout devices cover valve handles in addition to not allowing access. This ensures that a device is turned off and kept turned off. Valve Wheel Lockout devices can cover valve wheels in order to protect from unauthorized use. They come in different diameters to fit your equipment needs.